After WWII there were a lot of old recycled race cars from pre-war that made the Indy 500 starting field for several years as racers retooled. It was only natural as the war had stopped racing in its tracks from 1942 until resuming in 1946. 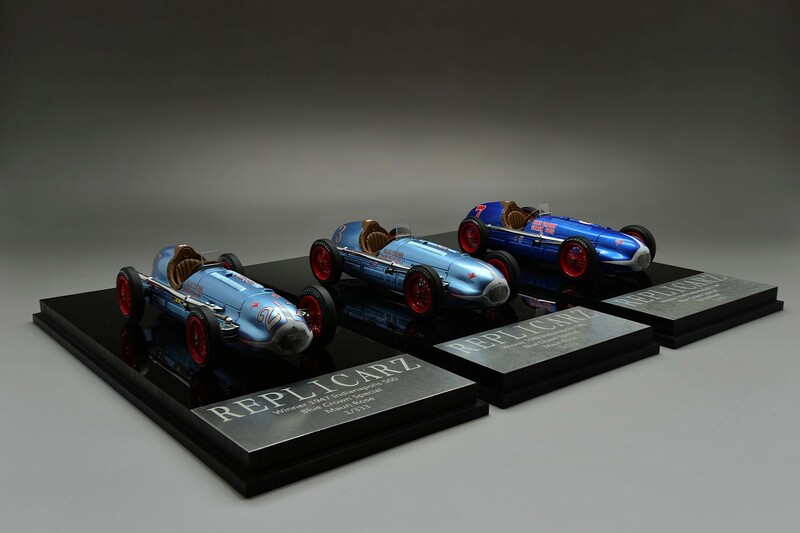 Three Blue Crown Spark Plug Specials by Replicarz. So along came Lou Moore who had been a successful Indy Car driver in the late 1920s and ‘30s, finishing second in 1928 and sitting on the pole as fastest qualifier in 1932. Before WWII his car’s won two Indy titles, but during the war he began planning for post-war success. 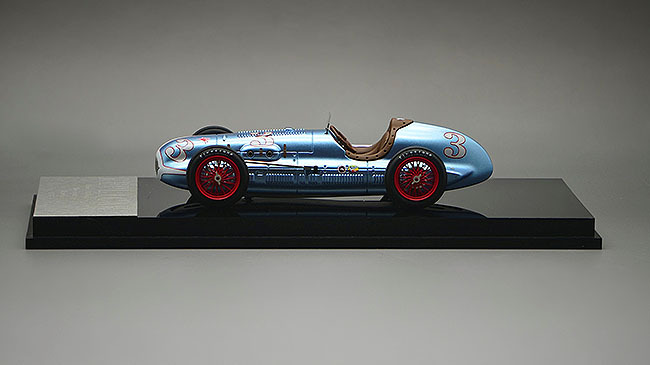 He had Leo Goosen design a front-drive race car while Moore set up a solid two-car team, ultimately sponsored by Blue Crown Spark Plug Co., a notable performance plug maker at the time. The cars weren’t ready to run in the 1946 Indy 500, but completely controlled the 1947-49 races with Rose and Holland in the cockpits. Being front-drive the Blue Crown’s had no driveshaft running the length of the car, so the driver’s sat lower. 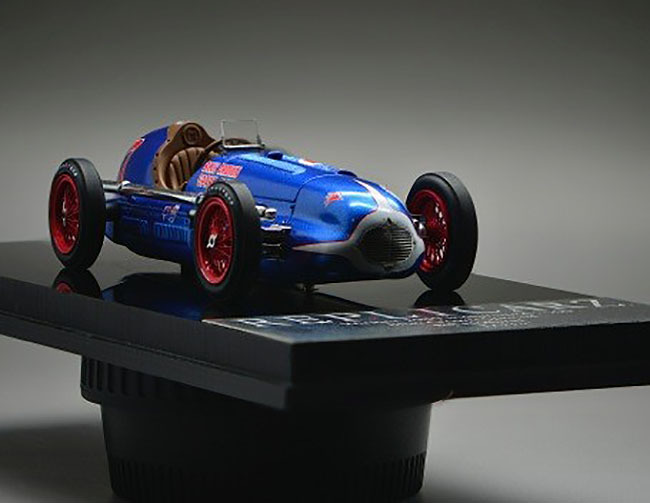 This gave the cars better balance and cornering ability, plus they were light, weighing just 1,650 lbs. Like Roger Penske’s teams later, Moore’s team kept the cars immaculate. Plus they were so efficient that the 270-horse Offy-powered racers only required one fuel stop during the 500-mile race. 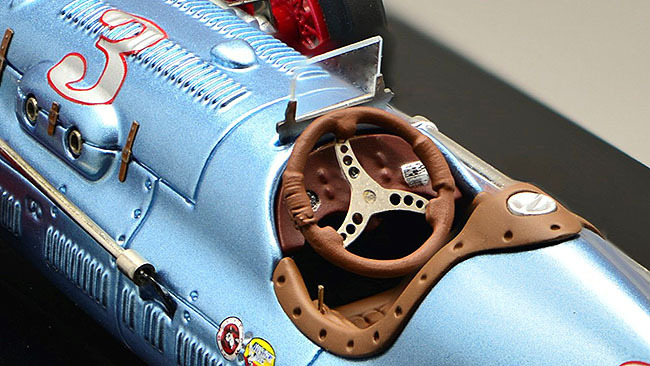 Beautiful interior for a 1:43 model. Simple, yet accurate. Rose won in 1947 and ’48, although Holland led until its final laps. Holland famously allowed Rose to pass him late in the race, thinking Rose was a lap behind. Both had been given the sign to slow down to preserve their cars, as both were well ahead of the rest of the field. Rose never slowed and edged Holland for the win. Both years Holland finished second. In 1949 Holland rightfully won and a third Blue Crown driver, George Connor, finished third. Rose had pushed hard to catch Holland while being told to pace himself and preserve a second place finish. Rose again ignored the team orders and damaged his car in the race’s final 10 laps. Moore was so upset he fired Rose after the race. With that, Moore’s successful run with the Blue Crown’s was over and Kurtis and Watson roadsters, along with other newer designs, took over Indy’s Victory Lane. These three blue beauties are equally handsome and realistic. It’s hard not to want one of each. The Rose 1947 Indy 500 winner, No. 27. The Rose cars, both a light metallic blue are No. 27 for the 1947 win and No. 3 for the 1948 win. They are virtually identical except for the numbers and a couple sponsor decals along the body, just below the cockpit. The Holland car is a darker and brighter metallic blue with its red No. 7 encircled by a white background that makes it the more visually exciting. All three feature red Blue Crown Spark Plug Spl. decals along the sides, just in front of the cockpit. And all have a red Pegasus, the Mobil Oil logo, on the sides of their noses. Markings are realistic to the historic racers. In addition to the well-executed shapes, the models have sharp photo-etched oval grills in their noses and finely executed metal ribs in the hoods and along the car’s lower sides that were cooling elements for the Offenhauser engine under the hood. The hood itself features creases for where it would open to allow engine access, plus three tiny leather straps and buckles designed in the original to keep the hood in place. 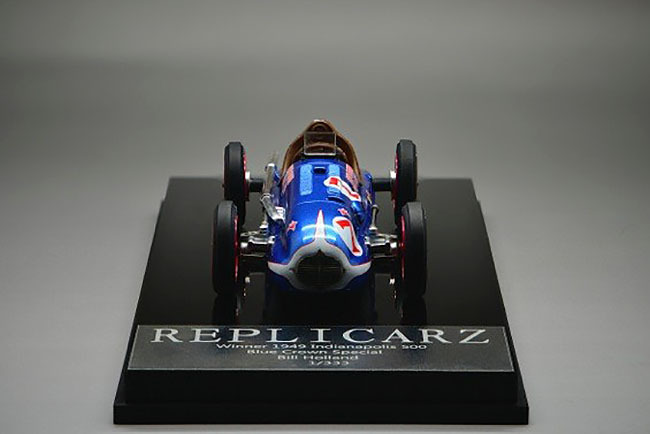 Holland’s car on the handsome Replicarz stand. The front suspension and steering mechanism are well shaped too and there are metallic steering arms that extend to the front-drive car’s front wheels along the car’s sides. I love the intricate red spokes of the wire wheels and well labeled Firestone tires that surround the hubs. Beautifully executed! 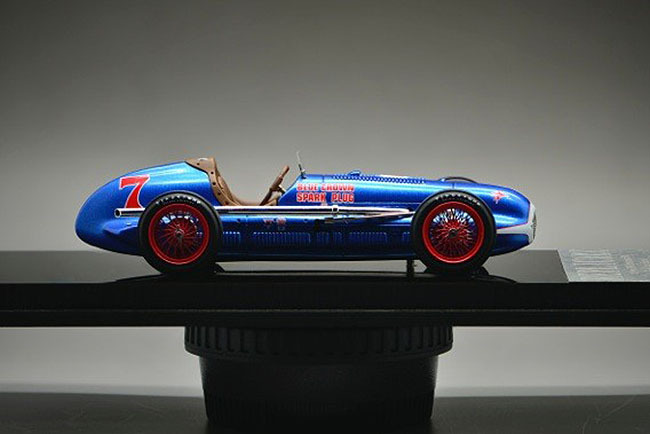 Just in front of the cockpit is a small metal framed windscreen, still popular among Indy racers in this era before more modern roadsters featured wraparound shields. And running the length of the racer’s right side is a chrome exhaust pipe. Replicarz creates a well detailed cockpit for this scale. These cockpits were simple though. This one is matte tan plastic reflecting the leather-look of the original. The seat is well-shaped and includes the ridged seat pattern of the day. The steering wheel is light brown too with a metal 3-spoke hub and what looks like wrapping on the wheel that would have cushioned the driver’s hands on a 500-mile drive. Really prefer this brighter blue, but all three cars look great. You also can see the gear shift lever on the cockpit’s right side along with metal-look pedals beyond the dash, which features three tiny gauges. 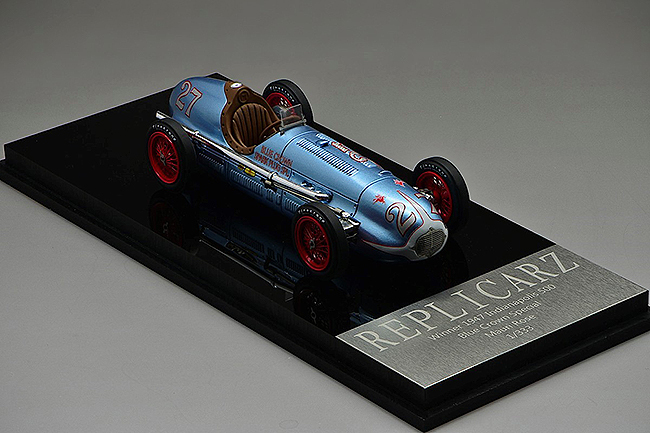 No display case is needed for these models as they come in sturdy acrylic cases and are attached to a gloss black base with metal ID plate with the winning car and driver info engraved in it, along with the Replicarz logo. All three models will be made in highly limited numbers, just 333 of each. 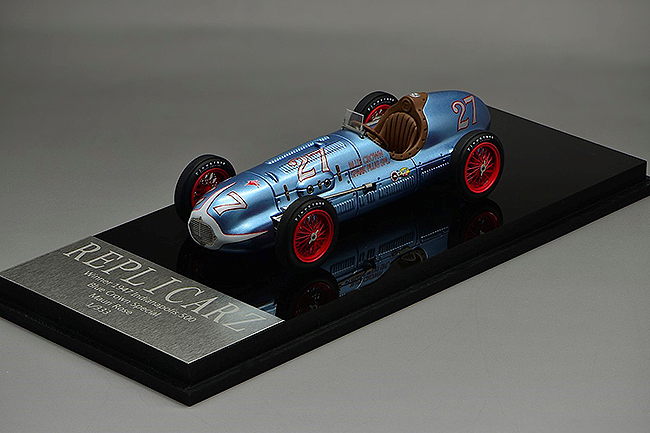 These are beautiful first offerings in this scale from Replicarz and pave the way for the Al Unser-driven 1970 and 1971 winning Johnny Lightning Specials that are due to be released in the next few months. Look for Danny Sullivan’s 1985 Indy winner and the 1928 Miller that won with Louis Meyer (a 3-time Indy winner) at the wheel, later this year too.